Aside from price, the only difference between the Service Dress Coats worn by Enlisted Airmen and those worn Officers is the addition of epaulets on the Officers’ version. Use our USAF Officer Coat Conversion Kit and a little DIY input to upgrade an Enlisted Service Dress Coat to Officer grade and save a lot more than you might think. The kit includes a pair of epaulets with button holes already in place—just tell us your jacket size in the selection box to the right so we send the appropriately sized epaulets. You also receive two 25-ligne buttons to be sewn onto the shoulders of your Enlisted Service Dress Coat, one on each shoulder to button the epaulet into place. Last but certainly not least is a 1/2”-wide Air Force Blue sleeve braid that’s more than long enough for both sleeves (braid is attached 3 inches from the end of the sleeve). 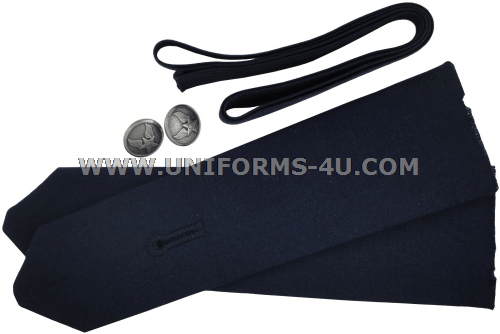 Note: 1/2” sleeve braid is worn on Coat sleeves of Officers ranked Colonel (O-6) and below. Brigadier Generals (O-7) and higher wear 1.5”-inch sleeve braid.